These Thanksgiving Home Décor projects are easy to make and will be a nice addition to your home this fall. In this tutorial you will learn how to make a woodland wreath accentuated with die cut leaves and a burlap bow to hang on your door or wall. As well as subway art piece of a traditional Thanksgiving verse and some miniature stuffed pumpkins. You are sure to have fun making these quick and ease décor projects. 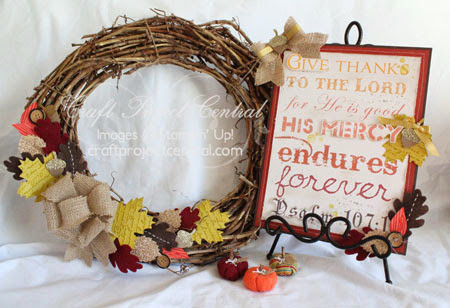 This beautiful fall project was created by Carrie! If you have a chance please stop by Carrie's blog and leave her a comment on her project.